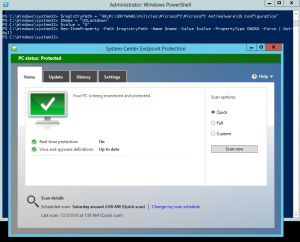 Simple powershell to enable the Microsoft Antimalware UI in an Azure virtual machine. This is the antimalware extension you can install on deployment, or through security center. Seeing this when trying to open System Center Endpoint Protection on an Azure virtual machine? By default the UI is disabled on an Azure VM. To enable you just need to change a registry value. Here is a quick powershell script to do that. After running that in powershell you can open the UI.